If you’ve made the decision as I have to add vegetables and fruits to your dog’s diet (see my blog Should my dog eat vegetables and fruits? ), it’s important to know how to prepare them, the ideal amounts to give your dog and what types of fruit and veg will best complement his diet. Your dog can eat most types of vegetables and fruits, apart from those listed as toxic in my previous blog Should my dog eat vegetables and fruits? I prefer the really nutrient dense leafy greens (including culinary herbs) over too many root vegetables. Avoid very starchy vegetables such as potatoes. Pumpkin however can be an amazing gut soother particularly for dogs experiencing mild cases of diarrhoea. 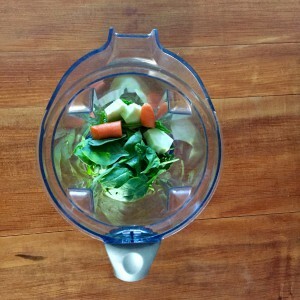 Ideally you should rotate different types of vegetables to maximise the nutrient mix over the course of a week. Include vegetables and fruits from different families too; this minimises the potential for an overload of particular plant constituents that can cause problems if consumed in large amounts. For instance, vegetables such as spinach and kale contain oxalic acids – when fed in excess, they can cause digestive upset and potentially kidney stones. But small amounts rotated with other vegetables make them a potent source of phytonutrients. Too many vegetables from the brassica family (broccoli, cabbage, brussel sprouts, cauliflower etc) can impact thyroid function due to the glucosinolates they contain, which block iodine uptake. But in small amounts and when lightly cooked, can be a great anti-cancer supplement to your dog’s meal (but should avoided for dogs with thyroid issues). Your dog doesn’t really have a biological need for carbohydrates in the diet, so I treat them more like a whole food supplement that add in an extra boost of nutrients and fibre. If you recall in my blog Making your own dog food – basic principles (part 1), vegetables should form about 5-10% of the meal. A little more or less in different meals is fine, but it should average out to about his percentage (assuming your dog tolerates them well). Dogs cannot digest all forms of raw vegetables. Fruit and vegetables have a rigid cell wall composed mainly of cellulose. It’s difficult for dogs to digest due to their shorter digestive tracts. As most nutrients are in cell wall, the cellulose needs to be broken down through some sort of ‘processing’, such as crushing or grinding, which mimics the chewing action of the herbivorous prey that would be the natural source of vegetable matter for dogs, but keeps the nutrients preserved. I have found one of the best methods is a good old fashioned mortar and pestle, grinding the vegetables up to a fine mash. It’s quite therapeutic too! But when I’m pressed for time, a good spin in the food processor also works well. Once finely pulped, add the vegetables to your fresh raw meals or even as a vitamin and enzyme booster to dry or processed foods if that’s what you feed. I usually mix it in well by hand with a rubber glove to prevent picky eaters from selectively bypassing the vegetables! Some dogs actually just love chewing on chunks of vegetables, like a carrot stick. It can be a great way of treating your dog if they like them without the kilojoules, but remember, you’re dog is not likely to be digesting these goodies in that form and you need to consider it as part of your 10% average vegetable intake. One of my all time favourite methods though is to ferment vegetables for my dogs. Think sauerkraut or kim-chi (the non-chilli variety!). Fermented foods are all the rage fortunately so you can usually find a good quality one in your local health food market or even supermarkets are getting on the bandwagon. But they are also incredibly easy to make yourself if you have the time. 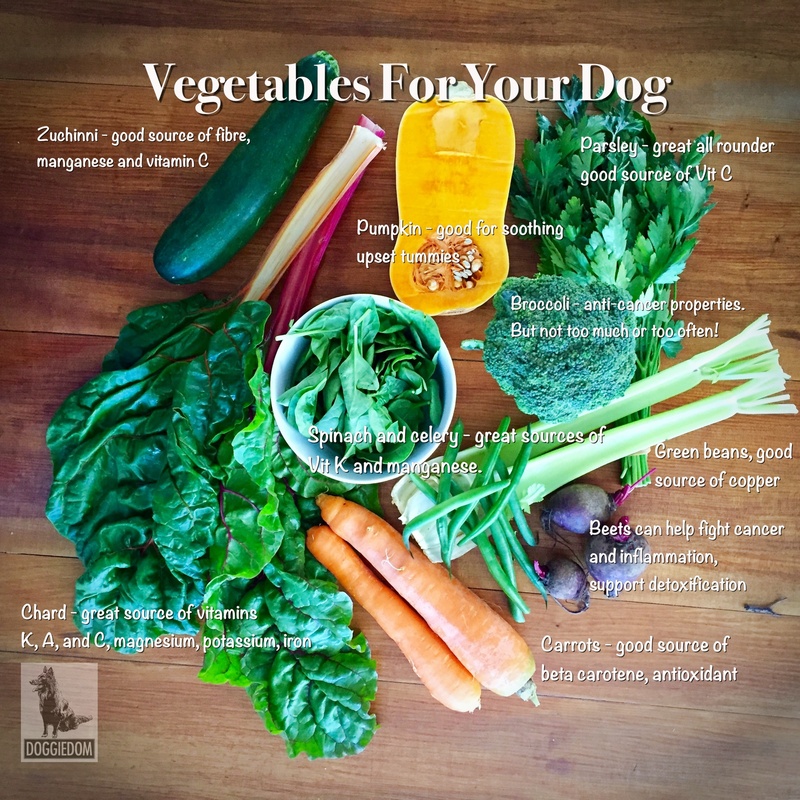 While some pet nutritionist advocate only raw vegetables, others believe most hard vegetables may benefit from light cooking to better release nutrients through easier digestibility. This includes sweet potato, pumpkin, green beans and other legumes, which are more digestible cooked rather than raw. I also prefer to steam foods in the brassica family to help reduce the impact of glucosinolates in these vegetables, which can interfere with thyroid function. Of course, it’s important to avoid overcooking vegetables, or you could be destroying the greatest value they add to your dogs diet – vitamins! The vegetables best served raw are herbs such as parsley, basil, and mint, sprouts, carrots, zucchini and soft squash, lettuce and mixed greens, peppers, beets. Fruits also offer a range of nutrients to support good health, high in soluble and insoluble fibre, vitamins, enzymes, antioxidants and minerals. There are studies that show the antioxidants in dark berries may help dogs remember what they learn better, and that both lycopene from cooked tomatoes, watermelon and other red foods help keep the brain sharp. Tropical fruits, such as pineapple and papaya, which are loaded with enzymes and anti-oxidants, and can aid digestion. 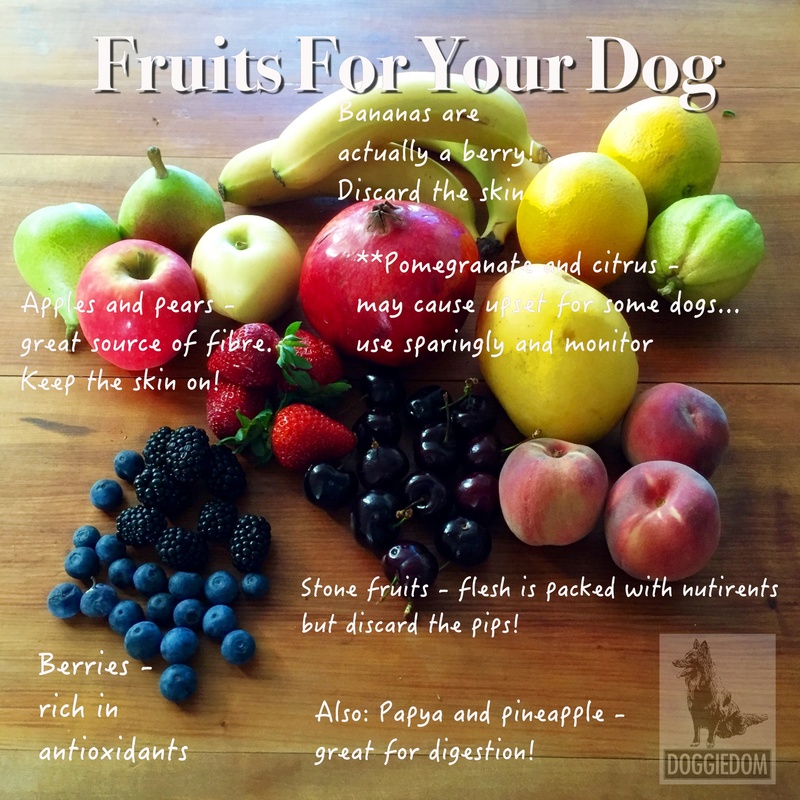 Most small animal nutritionists suggest over-ripe (as opposed to rotten or mouldy) fruits are best, as this closely mimics the form dogs would consume them in the wild as they forage off the ground. Other experts such as Andi Brown (see references below) suggest that fruit should only be fed on an empty stomach as it may stay in the tract too long and ferment if served in a meal. She suggests waiting 30 minutes after serving fruit before serving other food to your dog. Leila loves apples….and lots of other fruits! Of course, this is highly dependant on whether cats or dogs like the taste of fruit, particularly on its own! 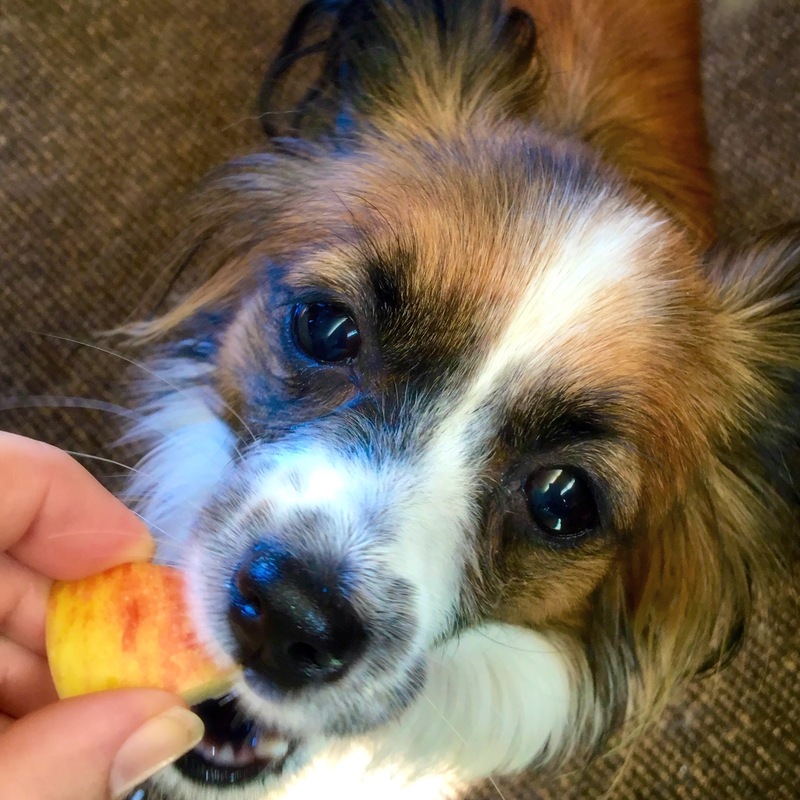 My new dog Leila loves most fruits just as they come. Rupert on the other hand needs more convincing although he’s partial to apples! Avoid feeding your dog dried fruits due to the high sugar contents and potential for toxicity. 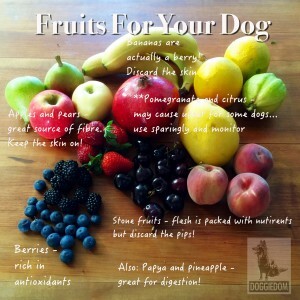 Do not feed your dog any of the seeds or stones in fruit. If you can, I’d strongly recommend feeding organic fruit and vegetables to your dog (and yourself! ), but if that’s not an option for you, then make sure you thoroughly wash the food before preparing it for your dog. Bailey, S (2008), The Naturally Healthy Dog; Real Dogs Don’t Eat Kibble, Creative Genius, USA. Billinghurst, Dr I (1993) Give Your Dog A Bone, 10th Print, Billinghurst Australia. Brown, A (2006) The Whole Pet Diet: Eight Weeks to Great Health for Dogs and Cats, Crown Publishing Group, USA. Middle, Dr C (2008), Real Food for Dogs & Cats, Fremantle Press, Australia. Olsen, L (2010), Raw & Natural Nutrition for Dogs, North Atlantic Books, USA. Schultze, K (1998), Natural Nutrition for Dogs and Cats – The Ultimate Diet, Hay House, USA. Taylor, B & Becker, K (2009), Dr Becker’s Real Food for Healthy Dogs & Cats, Natural Pet Productions, USA.